Today, we look at the Council At-Large candidates. As with yesterday, we start with a note on methodology. First, we calculate total raised and total spent across the entire cycle and not just over the course of one report period. Second, we separate self-funding from funds raised from others. Self-funding includes money from spouses. Third, for publicly financed candidates, we include public matching fund distributions that have been requested but not deposited in raised money and in the column entitled “Cash Balance With Requested Public Contributions.” That gives you a better idea of the true financial position of publicly financed campaigns. 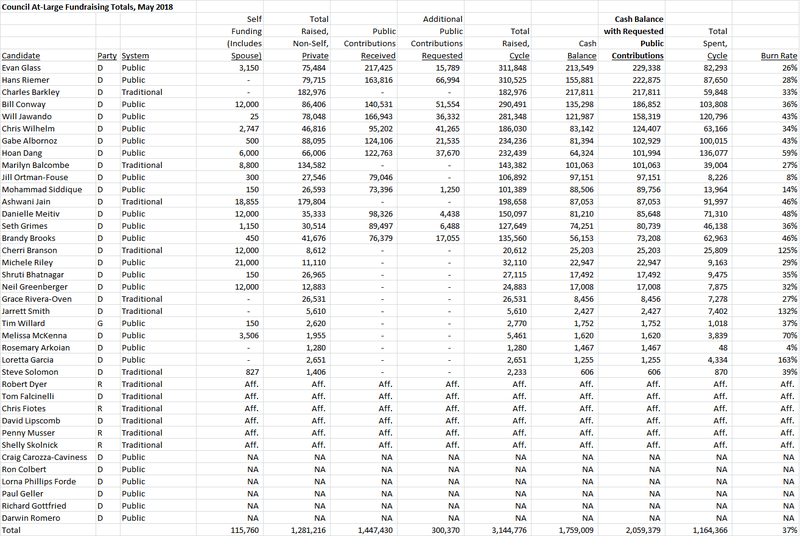 Below is our fundraising summary for the Council At-Large candidates. First, a few random notes. As of this writing, five at-large candidates – Craig Carozza-Caviness, Ron Colbert, Paul Geller, Richard Gottfried and Darwin Romero – have not filed May reports. Lorna Phillips Forde did file a May report and requested matching funds, but her report contains many duplicated entries and is a big mess. We are not printing her numbers until they get straightened out. Michele Riley has given herself a combined $21,000 in two loans and one contribution, which exceeds the $12,000 self-funding maximum allowed in public financing. That needs to be corrected or otherwise remedied. Now to the numbers. In the pre-public financing days, winning at-large candidates generally raised $250,000 or more with the notable exception of Marc Elrich. Four candidates are in that territory: Hans Riemer (the only incumbent), Evan Glass, Bill Conway and Will Jawando. Gabe Albornoz and Hoan Dang are not far off. Delegate Charles Barkley (D-39) has not raised quite that much, but he started with a big war chest built over years of little competition in his district. The cash on hand leaders are Glass, Riemer and Barkley, who are virtually tied, followed by Conway and then Jawando. In evaluating differences in cash position, we don’t find variances of $20,000-30,000 very significant. That’s because candidates schedule their expenditures differently. Some have spent a bit more before the deadline and some held back to show a bigger balance. What we do find significant is the difference between candidates who have close to $200,000 available for the final push – Riemer, Glass, Barkley and Conway – and those who have half that amount or less, such as Albornoz, Dang, Marilyn Balcombe, Jill Ortman-Fouse, Mohammad Siddique, Ashwani Jain, Danielle Meitiv, Seth Grimes and Brandy Brooks. (Forget about those who have $25,000 or less.) The latter group of candidates now faces very tough decisions on resource usage. A mailer to super-Dems can cost $35,000-$45,000 depending on how the universe is defined. So a candidate with $100,000 on hand might be able to squeeze out two or three mailers and that’s about it. Is that enough to stand out given all the other races going on? Institutional endorsements also play a role. Several of the lesser funded candidates, especially Brooks and Meitiv, have some good endorsements that could help them. We think the biggest beneficiary will be MCPS teacher Chris Wilhelm, who has more cash on hand than Albornoz, Dang and Balcombe and also has the Apple Ballot. If the teachers mail for Wilhelm, that could effectively close the gap a bit between him and the top-funded candidates. For what it’s worth, the conventional wisdom is that Riemer will be reelected, Glass and Jawando will join him and the last seat will come down to Conway or Albornoz. We’re not ready to buy that for a couple reasons. First, among the seven County Councils that have been elected since the current structure was established in 1990, only one – the 1998-2002 council – had zero at-large female members. Combine that with the fact that 60% of the primary electorate is female and it’s premature to write off all the women running. Second, this is an unprecedented year. We have never had public financing before and we have never had so many people running at-large. What seems like conventional wisdom now could seem very unwise in the blink of an eye! So we expect surprises in this historic election. Next: the council district races. Previous PostA Quick Note on MailersNext PostAnother Mail Firm, Please?